President Sister Jeanne Bessette has appointed Paul Ebert as DePaul Cristo Rey’s principal. Mr. Ebert has been a member of DPCR’s faculty and administration since the school opened in 2011 and has served as interim principal since October 2018. “I believe Paul’s vision for our school, as well as his insightful ideas about how to improve teaching, school culture and student learning outcomes will serve our students very well. Our students are his primary focus, as they should be,” says S. Jeanne. When DePaul Cristo Rey opened in 2011, Mr. Ebert was the school’s first English/Reading teacher. In this role he developed and implemented courses which led to significant increases in students’ English and reading test scores. He later became lead teacher, the freshman dean and assistant principal. While at DPCR he has been recognized as Educator of the Year and with a “You’ve Made A Difference” Award. He has also been named an “Outstanding Educator” by Cincy Magazine. 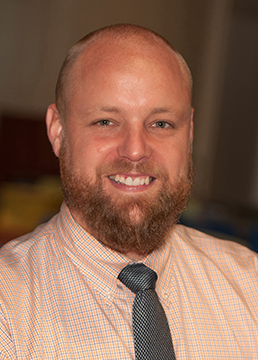 An alumnus of the University of Dayton, Mr. Ebert holds a bachelor’s degree in education and is currently pursuing a master’s degree in school administration. Mr. Ebert begins his role as principal immediately.